Confusion and lack of interest were the highlights of the annual gathering of scientists this year in Goa. "EVERY year, there is the same anarchy," moaned Shailendra Biswal, a 38-year-old physicist from Utkal University. Biswal was among several hundred delegates trying to obtain details of lodging and transport at the University of Goa on January 2, the eve of the inauguration of the 80th Indian Science Congress at Panaji. At the formal inauguration of the Congress, it was obvious that many of the scientific fraternity had yet to recover from the travails of finding their lodging. 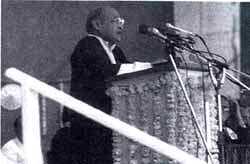 When the chief guest, Prime Minister P V Narasimha Rao, was delayed by more than two hours, a majority of the audience chose to doze off. Yet, some of them were alert enough to note the number of politicians on the dais was twice that of the scientists. The theme of the congress, "Science and the Quality of Life", found few takers. At the daily plenary session on the subject, almost all speakers argued for more funding for research. The only sober note came from C N R Rao, director of the Indian Institute of Science, Bangalore, who warned, "The government's economic policies only make import of technology easy. Because of liberalisation, a crisis situation is developing in Indian science and technology." The warning failed to excite the delegates. Many of their seniors had stayed only a little longer than the prime minister and could the delegates now please explore the tourist attractions? Indeed, a fair number of them had brought their families along. Thus, in comparison to the fair weather outside, the various sessions of the congress were desultory affairs. Those who read papers did so without objection or debate. The spirit of the Forum of Young Scientists was as dull as any other. No session was attended by more than two dozen-odd listeners. At the prize-winning lecture on "Optical Property of Rare Gases" delivered by G Amarnath of Sri Venkateshwara University, Tirupati, the only eager questioning came from two teachers. The mood of the congress was exemplified by events at the two-day Women's Forum. On the first day, there was no female speaker and no male listener. The total audience numbered 14. Forum convenor S P Arya felt the other sessions were "more attractive even to the women delegates." But on the second day, Arya organised a lively but limited debate on problems faced by women in scientific establishments. According to Jacqulin Weiss, a biochemist at the University of Manchester, women scientists were subject to the same forms of discrimination by male colleagues and this was compounded by the "no-ambition attitude of women researchers." Controversies, if any, went unnoticed. The Secretary of the Union department of electronics, N Vittal, suggested the government should introduce a low customs tariff regime on computer technologies. In the same forum, R Narasimhan, head of the computer science division of the Tata Institute of Fundamental Research, cautioned the government against signing the Dunkel Draft on Trade Related Intellectual Property System (TRIPS). Nobody drew attention to the contradiction inherent in the statements. The Congress came to life briefly on the issue of the Raj Kristo Dutt memorial award for 1993 to M C Bhandari for his work, Scientific Base of Astrology and Effect of Planets on Human Life. Bhandari is a chartered accountant and president of the Occult Foundation. "Claims of astrology have never been scientifically demonstrated," said S Chandrasekhar, director of the Centre for Liquid Crystal Research, Bangalore. When S Z Qasim, the outgoing president of the Congress, was questioned about the ethics of the decision to award the astrologer, he replied Bhandari's bio data had been most impressive. Nearly 4,450 delegates reported for the inaugural ceremony. By the closing session on January 8, only 282 were present. To the few present from outside Goa, the announcement of the theme for the next Congress, "Indian Science: Excellence and Accountability", brought little excitement. They were already engrossed in the issue of how to get home.